Turn your house into a pest repellant force field! Riddex Plus uses patented Digital Pulse Technology, powered by a Freescale Microprocessor, to create an irritating environment for pests inside your walls, chasing them away from your house while preventing future pests from entering. 100% safe and cruelty-free! Just plug in the Riddex Plus and it immediately starts paying for itself. 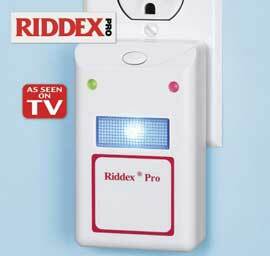 A single Riddex Plus unit covers an entire level of a typical home, effectively driving away rodents and roaches. Never use harmful chemical sprays or breathe noxious fumes from other pest control products ever again! Safe for use around children, pets, and electronics. Pulse Technology Laboratory tests have proven that Riddex Plus really works! Built-in nightlight and LED indicator! Electronics Over 3 million products sold!